Grunge, alt and punk all have their charms, but relatively few bands in those styles can flat-out rock the way the bands of the '60s and '70s could. And so it's an odd reality that it's often the senior citizens who have put out some of the hardest-rocking albums of the past few years. 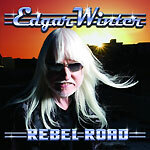 Edgar Winter, 61 years young, has been on the national scene since the late '60s, yet his latest album, "Rebel Road," not only rocks as hard as anything he did in this 20s, but contains some of his best songs in quite a while. If there's no "Frankenstein" or "Free Ride" here (Winter's two biggest hits), the opening (title) track is a classic rock anthem, with a driving rhythm and Slash's signature sound on lead guitar. Older brother Johnny sits in on "Rockin' the Blues," and country star Clint Black lends his harmonica and vocals to two songs. Changing pace, on "The Closer I Get," Winter balances out the guitars and drums with a cello for a chamber effect. "Peace and Love" is a mellow, Lennon-esque ballad. After more than four decades of performing and recording, "Rebel Road" shows Edgar Winter still has plenty to say through his music  and that when he wants to, he can rock most of the young kids right off the stage.